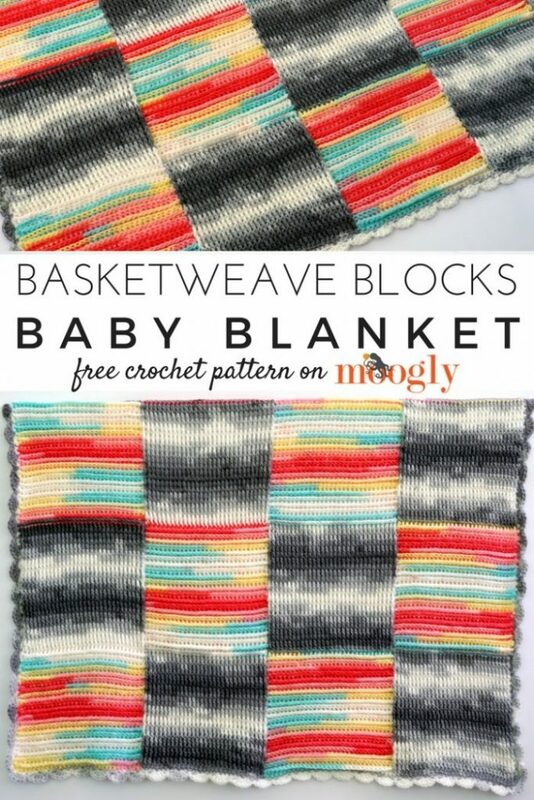 Basketweave Blocks Baby Blanket - Free #Crochet Pattern on Moogly! 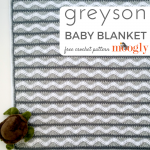 The Basketweave Blocks Baby Blanket combines the look of crochet squares with NO seaming – and takes the basketweave stitch to the extreme! It’s pretty heady stuff, but the end result is a cozy, soft, and totally nursery ready! Let’s rock these blocks! 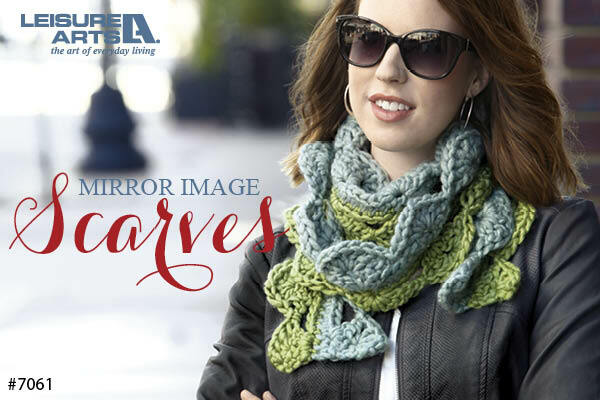 Disclaimer: The yarn for this pattern was provided by Lion Brand Yarn; this post includes affiliate links. Okay, so the key here is working with 4 skeins of yarn at once. 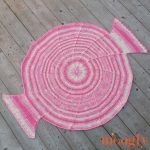 Just like when you’d make a striped pattern and carry the yarn along the side, but we’re going to be changing colors in the middle of the row (click here for a tutorial on that if needed)! This means that you’ll need to take a little time to keep your skeins from tangling. You can use the bucket method, or whatever method you prefer – just allow time for it after each turn, and it will pay off later! 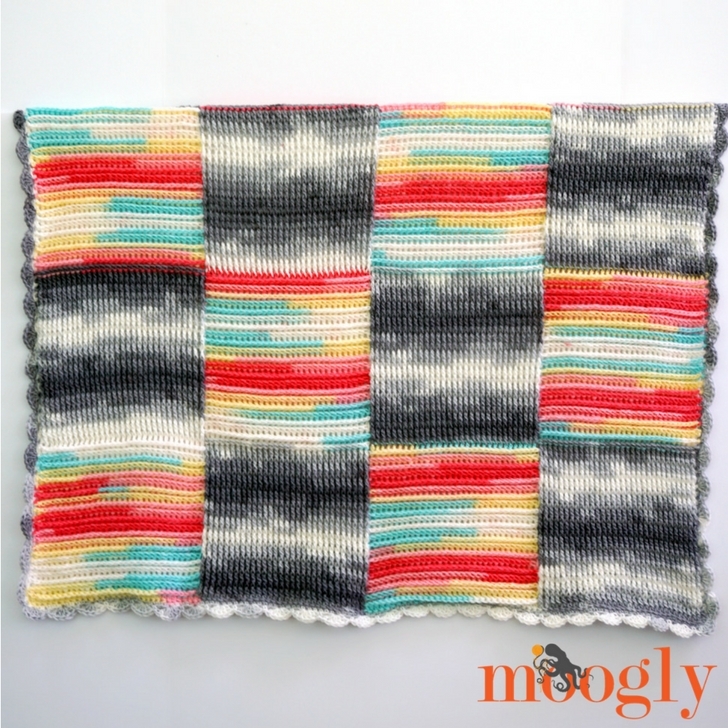 There are 3 rows where you do cut one of the yarns, and then work over the yarn tapestry style – that’s what moves the block colors over one space, to give them this great look! Special instructions for that are included in the notes below. So let’s get to that pattern! The colors switch 3 times per row – leave the previous yarn hanging from the last stitch to be picked up when you return to that stitch on the next row. 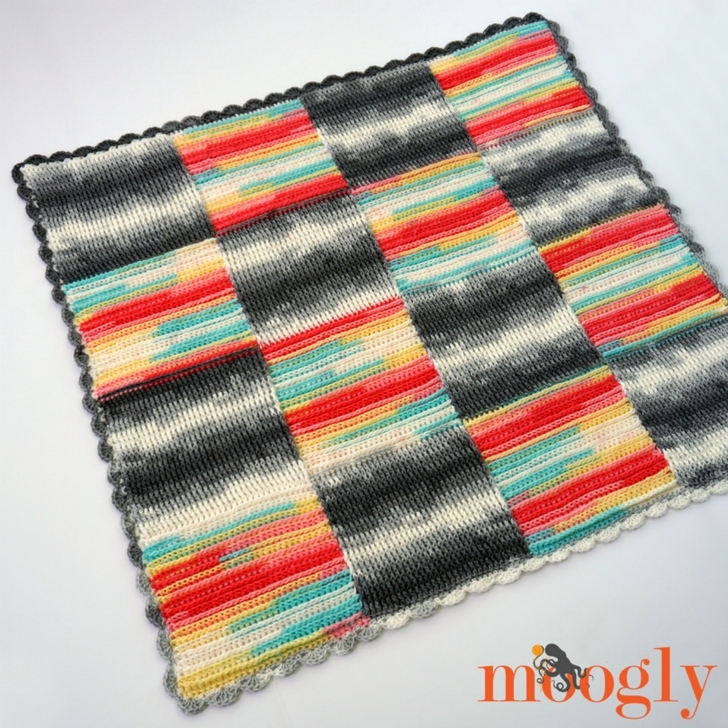 There is no stitch multiple required for this pattern – simply divide the number of stitches by the number of blocks desired, and switch colors accordingly. To work over a yarn while making post stitches (as in Rows 23, 45, and 67), insert the hook around the next st above the yarn on one side of the stitch, and below the yarn on the other side. Alternatively, you can break all 4 yarns on those rows and re-attach them in the new order. Begin with 4 balls of yarn, 2 of each colorway. Label these balls as follows: CA1 (colorway #1, ball 1), CB1 (colorway #2, ball 1), CA2 (colorway #1, ball 2), CB2 (colorway #2, ball 2). All four balls of yarn will be used in turn, on each row of the pattern. Rows 2 – 22: Ch 2 (counts as first st, here and throughout pattern), fpdc in next 31 sts, switch to next color, bpdc in next 31 sts, switch to next color, fpdc in next 31 sts, switch to last color, bpdc in next 31 sts, dc in last st; turn. After Row 22, break CB2. Row 23: With CB2 and working over CA1, join to 1st st and ch 2, bpdc in next 31 sts, switch to CA1 and working over CB1, fpdc in next 31 sts, switch to CB1 and working over CA2, bpdc in next 31 sts, switch to CA2, fpdc in next 31 sts, dc in last st; turn. Rows 24 – 44: Ch 2 (counts as first st, here and throughout pattern), bpdc in next 31 sts, switch to next color, fpdc in next 31 sts, switch to next color, bpdc in next 31 sts, switch to last color, fpdc in next 31 sts, dc in last st; turn. After Row 22, break CA2. Row 45: With CA2 and working over CB2, join to 1st st and ch 2, fpdc in next 31 sts, switch to CB2 and working over CA1, bpdc in next 31 sts, switch to CA1 and working over CB1, fpdc in next 31 sts, switch to CB1, bpdc in next 31 sts, dc in last st; turn. Rows 46 – 66: Rep Rows 2-22. After Row 66, break CB1. Row 67: With CB1 and working over CA2, join to 1st st and ch 2, bpdc in next 31 sts, switch to CA2 and working over CB2, fpdc in next 31 sts, switch to CB2 and working over CA1, bpdc in next 31 sts, switch to CA1, fpdc in next 31 sts, dc in last st; turn. Rows 68 – 88: Rep Rows 24-44. After Row 88, break 3 of the yarns, leaving a ball of CA1 or CA2 attached. Edging: With CA ch 1, sc evenly around blanket; join and break yarn or add border if desired. Border Shown (optional): *Sc, ch 1, skip 1, 5 dc, ch 1, skip 1; rep from * around, adjusting number of chains skipped as needed; join and break yarn. And that’s the Basketweave Blocks Baby Blanket! I hope you enjoy making it! If you do, be sure to share your photos with me on social media – I love seeing what you make! Colors make all the difference. 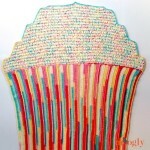 You can make this same pattern in different color and it would look like a baby blanket. You picked some very interesting yarn in this project.